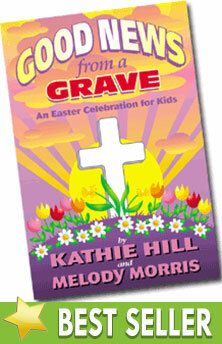 Good News from a Grave Easter/Resurrection : Kathie Hill Music, LLC, Making music with and for kids for over 25 years! Got eight weeks? Need a kid's Easter musical? You can do it and do it well with Good News from a Grave from Kathie Hill Music. Re-teaming with co-writer Melody Morris (Fish Tales and Promise U) Kathie relates the events from Palm Sunday through Easter Sunday in the very setting where the resurrection occurred - a graveyard! For their "Saturday Service," kids are helping the caretaker at Good News Gardens prepare for the annual Easter sunrise service. As they rake, sweep, scrub and clip, the children recall the highlights of the Passion Week with joyous, high-energy songs, ranging from Broadway to hip hop to salsa and thoughtful compositions detailing Jesus' suffering and sacrifice for our sins. This highly evangelistic musical details Jesus' last days and will help children fully appreciate the gospel, the Good News from a Grave! This was AWESOME!!! We don't have a large group so this fit the ticket perfectly. The kids loved the bright, up-tempo music and the message was amazing...the good news really came from a grave! I highly recommend this musical. Thank you for the option of splitting a few of the parts in Good News from a Grave - now it is perfect for us! The kids love the songs and are very excited! Thank you for writing such a wonderful Easter Pageant! Our congregation is going to love it!! When I handed out the Good News from a Grave CDs to my small kids' choir one of the children piped up, "Wow! You really like Kathie Hill!" I haven't done ALL her musicals, but I'm aiming for just that. The music is always marvelous and the scriptural content that gets planted into children's hearts is awesome. Kathie's Note: This is a great, short Easter musical with a very contemporary feel. You can perform it outside so it works for presentations outside the church. Easy dialogue makes it work for small choirs or for big choirs with a short rehearsal period. Very clever choreography on the video and funny twist at the end. My favorite songs are “J-E-S-U-S, He’s the Best”, “ Nobody Else But Jesus” and “ The Cross Crosses Out My Sin” is a GREAT evangelical song. Downloadable 3x licensed PDF of all songs, script, production notes & piano transcriptions (up to 91 pgs) with permission to make 3 copies . Additional copies require purchase of additional 3x license/s. Downloadable orchestrations for 4 songs with brass.